As mentioned in our previous article, it is now possible to route incoming chat requests via Salesforce Skills-based routing. Skills-based routing ensures that, out of the available agents, the best one gets selected to answer the incoming question. These questions may be sent via e-mail, web form or, now also via chat. We don’t go in detail about configuring email-to-case or web-to-case in this article. Setting up and configuring these long-existing functionalities does’t change when you start using skills-based routing. 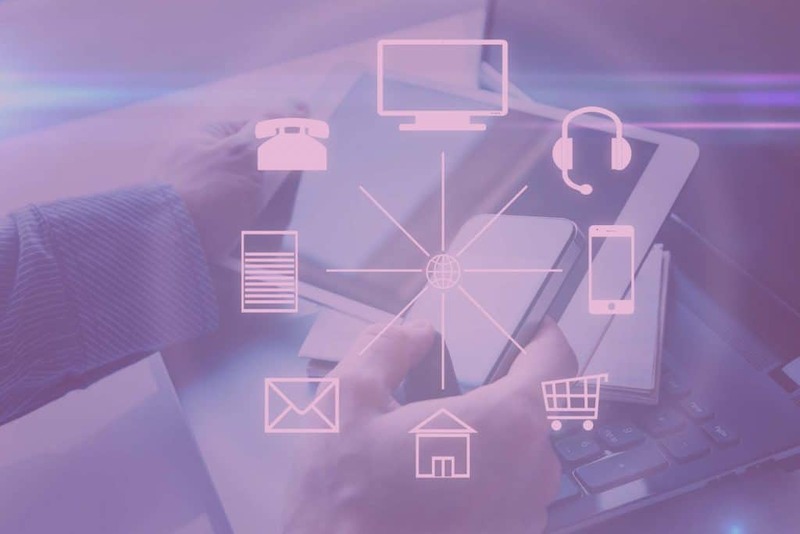 However, in this article we focus on the activation of skills-based routing and how adding chat into the support mix. What is described in these pages is a basic configuration. You might want to enhance this code to make your skills-based routing more intelligent and/or flexible. As mentioned earlier, skills-based routing for incoming chat requests has become available in Salesforce (in beta at the time of writing). Clearly, this enhances the possibilities to include Salesforce Live Agent in your support mix. And, compared with other routing solutions that integrate with Salesforce, this creates a clear differentiator. By activating Omni-Channel and Skills-based Routing, you now have some extra Routing Types available. Activating Omni-Channel enables the default ‘Omni-Channel Queues‘ option. 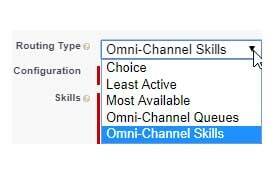 By selecting Skills-based routing, also ‘Omni-Channel Skills‘ became available. As we want to use Skills-based routing, we chose the last option in this picklist. In scenario A, we define one Skill. When Salesforce calculates the routing possibilities, EVERY Service Resource that has Skill A assigned, will be eligible for routing. In scenario B, we define three Skills. When Salesforce calculates the routing possibilities, only Service Resources that have ALL Selected Skills will be eligible for routing. 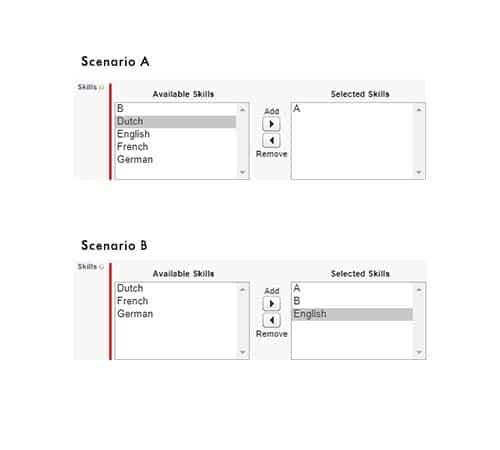 For instance, in scenario B, we have Service Resources that have Skills A and English, but nobody has Skill B defined, then no agent will be available for this incoming request. To be eligible for answering incoming request, Service Resource need ALL Skills that get selected in the Routing Type. Setting up Email-to-Case and Web-to-Case don’t change as such. But when you want to route these type of Cases via Omni-Channel Skills-Based Routing, then you will want to add Skills for these channels in the Routing Types. This allows you to differentiate Skills for agents at that level as well. All in all, setting up Skills-Based Routing is not very complex. However, you should take into account some specifics, as mentioned here above. And obviously, what is described in this article, is a basic configuration. An actual implementation may become more complex, depending on the teams, processes, products, etc that are used in your organisation. Would you like to start with Omni-Channel Skills-based routing? But you need some support? Then let’s discuss on how implementing this in your company. This entry was posted in Salesforce and tagged chat, live agent, Omnichannel, routing, Salesforce, Salesforce Omnichannel, skills, skills-based routing.